Gordon Banks was in goal when Leicester lost 2-0 against Spurs in the 1961 FA Cup finalThis article was originally published on 29 December 2017.England's most famous goalkeeper, Gordon Banks, has died aged 81.To mark his 80th birthday on 30 December 2017, Radio 5 live's Sportsweek spoke to the 1966 World Cup-winner to reflect on his life and career. Banks left school early to work as a coal bagger in SheffieldYou couldn't say playing for Sheffield Boys gave me much experience - I was dropped after two games.I left school late in 1952. My father told me that if I was still playing for them he would have let me stay at school till the end of the season but that he needed me to go out and get some money in. It is important to remember that we were a very poor family.My first job was as a bagger on the local coal round. I was 15.A guy brought the coal from the railway and I had to shovel it into the bags while he held them open on the lorry. We'd go round the houses and drop them into the coal cellars so that people could have a nice hot fire during the winter.My brother then got me a job as an apprentice bricklayer. When I got there they took me as cheap labour, I was mixing concrete and digging ditches, I didn't realise at the time it was building the muscles in my arms and legs. It helped me in a roundabout way. Banks won his first England cap against Scotland at Wembley on 6 April 1963. Sir Alf Ramsey took over as manager on 1 May 1963, demanding sole control over team selection. He remained in charge for 11 years, during which England won the 1966 World Cup.With Alf Ramsey you had to do exactly what he told you to do. You could not say no at all, otherwise you'd be a goner. He just wouldn't have you.He was a disciplinarian. You had to be back by an appointed time if you'd gone out, or downstairs for a meeting or breakfast on time. It was be there or get a rollicking.But Ramsey was a great manager. By the time he picked me for England I was training properly with my club and I always made sure that I did exactly what he asked of me.He would never ever tell you the team until the morning of the match, so we would be training for three or four days before and nobody could be sure they were playing.He wanted that uncertainty in your mind, that you didn't assume you'd been picked. He wanted you to know that you were part of a group and that he would make the decision. Banks was in goal when England beat West Germany 4-2 in the 1966 World Cup final at Wembley. Geoff Hurst scored a hat-trick as England won in extra-time. England had spent the build-up to the match staying at a hotel in nearby Hendon.On the morning of the game a few of the lads went shopping in Hendon. We thought it would knock a few minutes off the day and help to relieve some of the tension.It was only a five-minute walk from the hotel and we were just starting to take a look around when a few people spotted us and started to shake our hands, wish us all the best.We thought we'd better get back or we will be tired out. By the time we could back to the hotel a little crowd had started to gather. The England players were in increasing demand throughout the summer of 1966Later on I remember looking up at the stands and saw people making their way out. I thought it meant the game must nearly be finished.And then Bobby Moore got the ball.He was just outside the box on my left-hand side. About three of us were shouting "just get it away, get it away". He took his time, he looked up and saw that Geoff Hurst from just this side of our half had started to push towards their goal.Bobby hit this pass - you've never seen the likes. It was over Geoff's head and into his path.Geoff sprinted and thumped the ball into the top corner. Geoff always says that he knew the game was almost over so he had in his mind to whack the ball as hard as he could. If it goes over, it would then take the goalkeeper ages to get it and the game would be over. After the match I remember it was red hot in the dressing room. We were all hugging and congratulating each other.Alf was so delighted - it was great. We could not believe we had done it.In the evening we moved to the Royal Garden Hotel in Kensington. We'd not seen our wives for three or four weeks. My wife and I went to the room, had a nice hug. I said: "Come on then, get ready, we are going down to have dinner. "She said: "No I'm not, I've not been invited. "I thought she was joking but the FA had not invited the wives. We were gutted. I went down for the meal and afterwards the time was our own. A few of the lads who lived around London went out to nightclubs. We stayed at the hotel bar, had a drink and talked about what had happened. 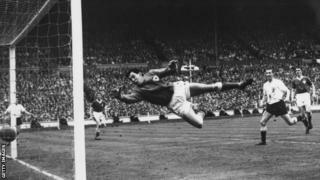 Banks was a Leicester City player when England won in 1966 but the following year, with Peter Shilton emerging, the club decided to sell their World Cup winner. Liverpool were rumoured to be interested but would not meet the £50,000 asking price. Banks joined Stoke and remained there until he retired in 1973. Banks had lost the sight in his right eye after a car crash in October 1972.When Leicester put me up for sale I saw Roger Hunt at an international match. He said: "Don't sign for anybody - Bill Shankly is coming for you. "I thought to myself "that'll do for me". Liverpool had been a top side for a number of years.I sat and waited and the weeks went by and I thought they were supposed to be coming for me.I thought I was worth £50,000. I'd been at Leicester for eight years and played in five cup finals - two League Cup finals, two FA Cup finals and a World Cup final.Eventually the manager at Leicester came up to me and said Stoke are interested and would I like to speak to them.I was about 28, I was at my peak and Leicester had put me up for sale. I honestly could not get away fast enough and play for a club that wanted me. So I signed for Stoke. Watch: Banks makes wonder save to deny Pele at 1970 World CupWhen we arrived in Mexico it was red hot, so whenever we trained or practised we were wet through.The sun was out all the time so the turf was rock hard and of course when we started shooting sessions the ball seemed to be kicking up quite high. I thought I'd better get some more practice in here - get used to it kicking up.That is exactly what happened.I saw Pele racing to the edge of the box. I had a quick look before their winger Jairzinho crossed the ball - Pele had got in front of Alan Mullery.Jairzinho centered the ball, but I could not come out for the cross. I knew from the penalty spot it would have to be a fantastic header to beat me.But the ground was hard so I thought I should get off my line and as I dived I had to anticipate how high it was going to bounce. I got a hand to it, the ball actually hit the top of my hand and looked as though it was going into the top of the net.As I hit the floor I saw that the ball had missed the goal. At first I thought "you lucky so and so" but then I realised it has been a bit special.I've met Pele many times since and we often have a chat about it. He thought he'd scored.